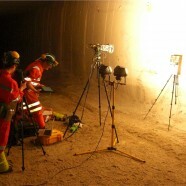 The following release comes from STFC, the UK Centre for Astrobiology and the Boulby Underground Science Laboratory. Recently, in a collaboration between STFC, the UK Centre for Astrobiology and the Boulby Underground Science Laboratory, a new segment to the Boulby underground facility – a permanent microbiology/astrobiology lab was established. It is the first permanent underground astrobiology laboratory to be opened. In order to encourage new biological/space technology work using the facility we are planning an open day to scientists with existing peer-reviewed science or plans for deep underground science to visit the laboratory and hear about the work there. Work of relevance includes: astrobiology, deep subsurface biosphere research, below background levels of radiation research, Mars analogue research, space technology testing and related areas. The day will consist of a visit to the mine and some short surface talks about astrobiology, microbiology, deep science and the Boulby Underground Science Facility. The purpose is to introduce Boulby and encourage more scientific research there. The event will be on September 8, 2014. This event is limited to ten people and will be organised on a first come, first served basis. However, there will be future opportunities. If you are interested please contact Charles Cockell (c.s.cockell@ed.ac.uk).